The holidays are by far the busiest time of year in ecommerce fulfillment. After the holiday shopping season comes the season of holiday returns. It’s time to start prepping your operation to handle holiday returns and exchanges. Dealing with returns is a costly necessity of doing business. The key is to make sure that the process is handled in a way that keeps customers coming back. Too many online retailers gear up for holiday sales and then fall short when it comes to managing holiday returns that inevitably happen in late December and January. Dotcom Distribution data finds 74 percent of consumers reporting that a hassle-free return policy can persuade them to buy from an online retailer, regardless of whether or not they have purchased items from the retailer in the past. The first step in properly handling holiday returns is to set up a returns policy that is fair and clear to customers. Your policy should outline exactly what items are returnable or exchangeable, what condition they need to be in and how and when customers can go about making those returns or exchanges. Free return shipping — Avoid, wherever possible, charging customers who want to return an item that doesn’t fit or suit them. If you’re using something like ShipStation, you can include a pre-printed label right in the box for effortless returns. Refund information — How will customers be credited for their returns? Explain when full credit will be issued, and in what method, or if a restocking fee will ever be deducted. It’s usually best to avoid deducting from the refund unless the item is unable to be sold again. 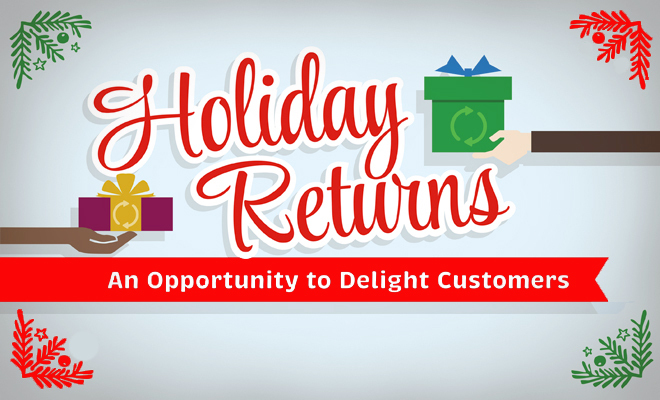 The physical return process — Clearly explain how customers can get merchandise back to you. Do they need an RMA first? If so, how do they get it? Try to keep the process as simple and as automated as possible. Clear expectations — State when refunds will be issued after returns are received, and how customers will be notified about the status of their return or refund. Contact information — If a question comes up, customers should absolutely have a way to get in touch with someone — quickly. As with any department, training is an essential part of handling post-holiday rush. If your team is lost, your customers will know. Make sure everyone involved with the customer service department knows what to expect in regards to returns and exchanges ahead of time to avoid any confusion. Return period length — How long will customers have to return an item? Are you extending the return period for purchases between specific dates? Exchanges — Are you offering exchanges for any or all purchases and/or gifts? Receipts — Do returns have to come with a receipt or proof of purchase (for example, a picture of a packing slip, forwarded email receipt, or another receipt of some kind)? Damaged goods — If a customer reports a damaged product, will they be asked to ship it back or provide any proof of damage? How will a replacement be provided? You also want to make sure that the process you outline is easy for customers. For example, don’t require them to pack up a box and then write out an address and buy postage. Give them a printable packing slip and clear instructions for how to send the item back. It might also be necessary for you to hire some temporary help so that you can handle all the extra work without overworking your team or negatively impacting the customer experience. You can also offer special deals to those making returns so that you can make even more sales once the holiday season has concluded. Or you can even lay out your store so that those making returns are likely to come across some potential impulse purchases. With some planning and communication things can run smoothly and be far less painful than you may expect. As long as you prepare, your post-holiday returns should not cause you any excess worry.